I do a lot of browsing, especially of food-related Web sites. What can I say? I'm obsessed. :) I would like to share some of my finds with you. I'm thinking of making this a regular feature here at MinxEats. What do you think? 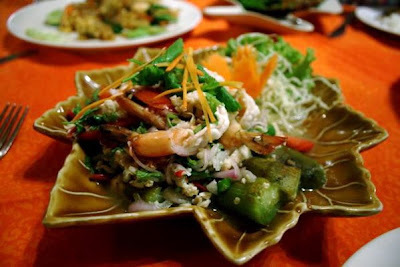 Yum Makeua Yao with shrimp, Thai grilled eggplant salad. Photo by eGulletteer BryanZ. Photos like the one above of amazing Asian cuisine from Thailand, Singapore, Vietnam, and Japan can be found in this eGullet thread. OMG delicious-looking stuff. It's State Fair time again! Check out these lovely nibbles from Iowa. Well, they're not all lovely. I'm a little obsessed with Banh Mi right now. Don't these burgers look delish? Mastering the Art of French Cooking tops the NY Times best seller list! About time! I love looking at the food photos on Photograzing and checking out the food blogs behind them. You'll even find some of my photos there. I like it. I do a lot of food blog browsing myself (you should see the stack of recipes I've printed and haven't tried yet.) May save me some time...or add to it. Thanks.